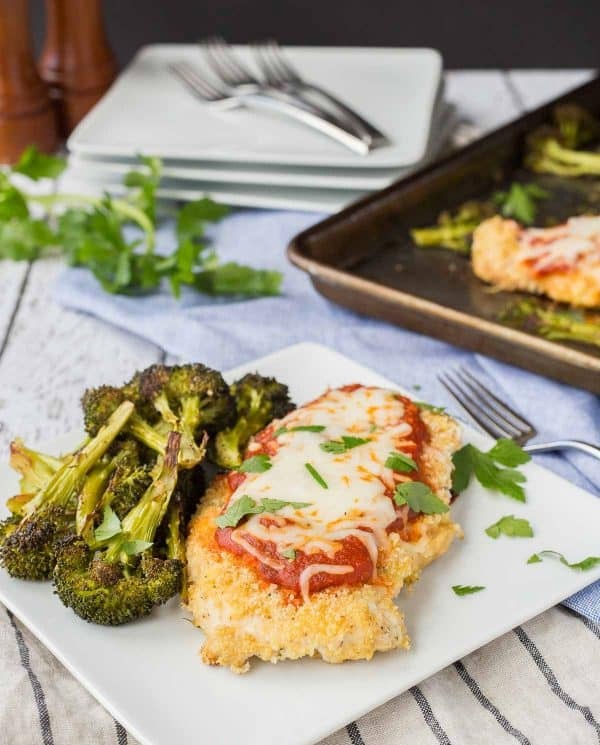 Dinner on one pan – this sheet pan baked chicken parmesan is not only healthier than the original, it’s also easier! It’s going to become a dinnertime fave. I repeat, my son ate meat. I proceeded to give him the smallest bite ever because I was sure it would be spit back out into the trash but much to my surprise, he devoured it. And he ate it again at dinner! It’s a dream come true. It’s not only a dream come true for him, it’s also a dream come true for me. It only makes one pan dirty and is healthy, simple to make and obviously a crowd pleaser. If you’ve never tried roasted broccoli, you’re missing you. It’s one of my favorite ways to eat broccoli and it’s been known to turn a broccoli hater into a broccoli lover. Not my little man though, ha. Let’s not get crazy here. PS: Love this? Try my healthy chicken cordon bleu, sheet pan apple gouda chicken, or Dijon dill chicken thighs. 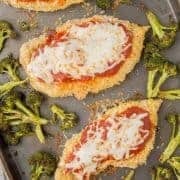 Dinner on one pan — this sheet pan baked chicken parmesan is not only healthier than the original, it’s also easier! It’s going to become a dinnertime favorite. Place broccoli on rimmed sheet pan and drizzle with 1 tablespoon olive oil. Sprinkle with salt and pepper, toss with spatula so broccoli is coated with oil. Prepare three shallow bowls for breading the chicken. In the first, place flour, salt, pepper, garlic powder. Stir to combine. In the second bowl, beat the egg. In the third bowl, mix together panko bread crumbs, Parmesan cheese, and oregano. Place chicken on a cutting board and top with wax paper or plastic wrap. Using a meat mallet or a rolling pin, flatten chicken to about 1/2 inch — the key is that you want it to have even thickness. 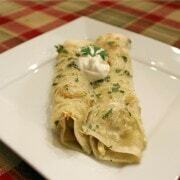 Take one piece of chicken and coat in flour mixture, then dip in egg mixture. Let excess drip off and then dip in Panko and Parmesan mixture. Place on baking sheet with broccoli. Repeat with remaining chicken breasts. 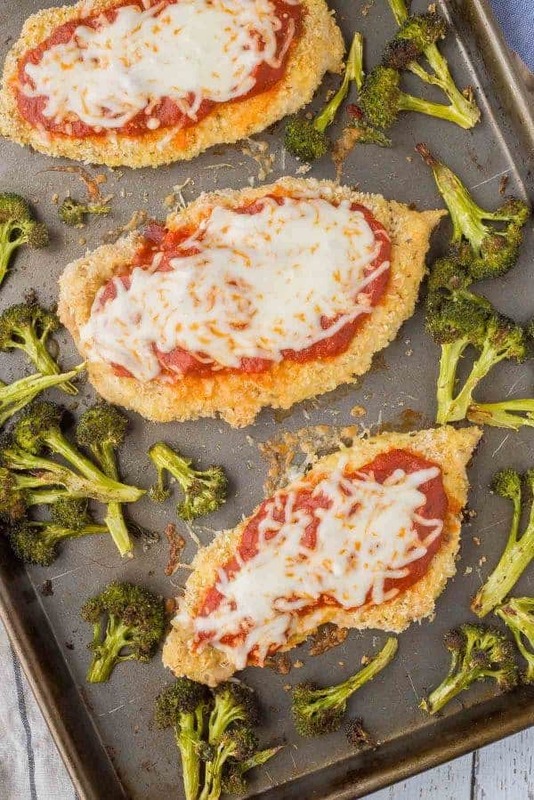 Bake for 15 minutes, toss broccoli around so it gets brown on all sides, and cook for 10 minutes more. 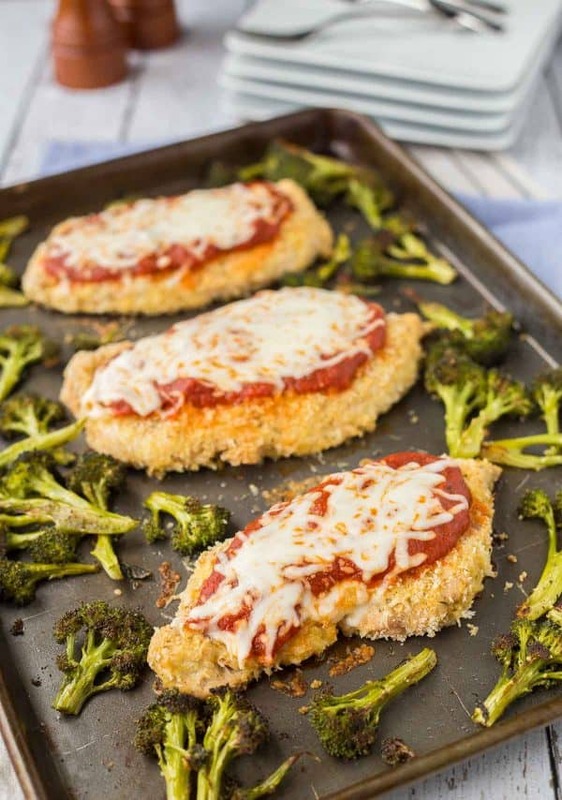 Remove from oven and carefully add marinara sauce and mozzarella cheese to the top of each chicken breast. Return to oven for 5 minutes or until cheese is melted. 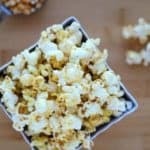 Verdict: Loved this easy and healthy recipe! 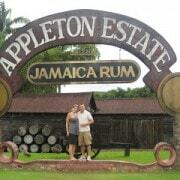 Husband’s take: No complaints from him. My mom loved it too, and we already discussed N.
This is a one pan dinner I need to put on my rotation! Looks delicious! If N approves, I approve! I love a sheet pan dish and this is one of our favorites! It’s such a classic and everyone here loves it!